McDonald's China isn't the only place with black buns. 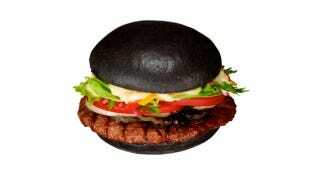 In Japan, Burger King will soon offer the Premium Kuro (Black) Burger on September 28. This burger marks the fifth anniversary of BK's return to Japan and the concept behind the hamburger is "irrationality"—because hamburgers with black buns ARE CRAZY. To achieve that dark hue, the buns were made with bamboo charcoal. It's also slathered in "black ketchup", which is made from squid ink and garlic. Price at ¥480, the Premium Kuro Burger is available for a limited time only. And yet, all I can think about right now is Mario Kart.